Nothing is quite as cozy as a pot pie on a brisk fall evening. We like to celebrate Halloween throughout the months of September and October so I actually made these just the other night. It might not have been brisk out, and technically it is still the end of Summer, but they were perfect for getting us into the Halloween mood. 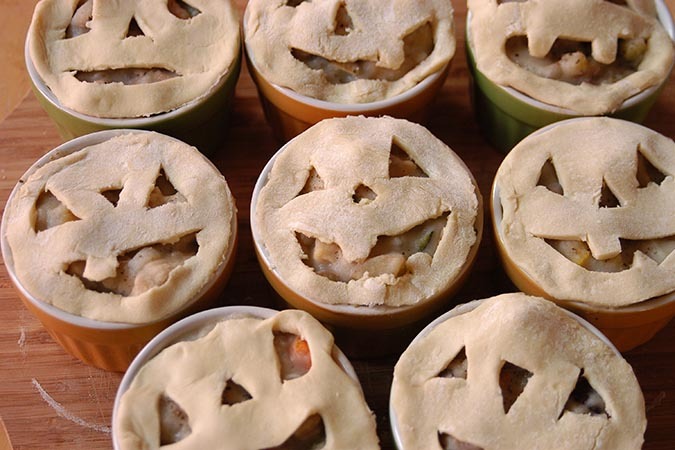 I had found dark purple potatoes and paired them with some carrots for a very festive pot pie, but you can use whatever potatoes you have on hand, the jack o’lantern faces will festive them up! Remove puff pastry from the freezer and allow to sit out covered with a towel on a cutting board. Preheat oven to 350F and lay out ramekins on a cookie sheet. 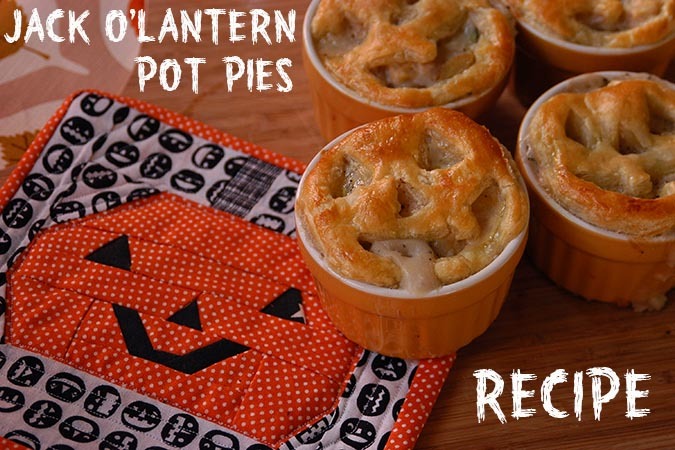 I used 12 small ramekins for mine, you can also optionally use one large pie plate and create one jack o’lantern face for the top. Find a circle cup that is about the same size as your ramekins for cutting out the faces, or save one ramekin aside for cutting. Heat oil over medium heat in a Dutch oven or heavy bottomed saucepan. Add veggies and sauté until onions are translucent. 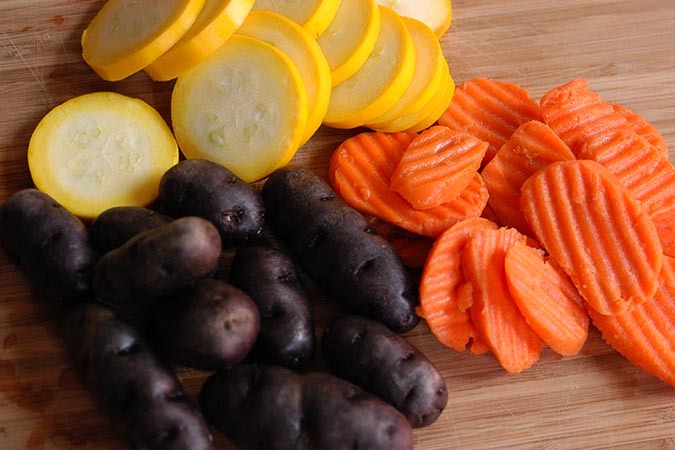 Pour flour over veggies and stir until all the veggies are coated, allow to cook for about two minutes. Add veggie broth and allow to simmer until veggies are tender. Add milk and a fully cooked protein (I use quorn brand fake chicken chunks) and remove from heat. Season with salt and pepper. Allow to cool slightly to thicken. If your mixture is still too thin or watery add a few tablespoons of plain potato flakes. Stir the flakes well and allow to absorb the broth before adding any more. 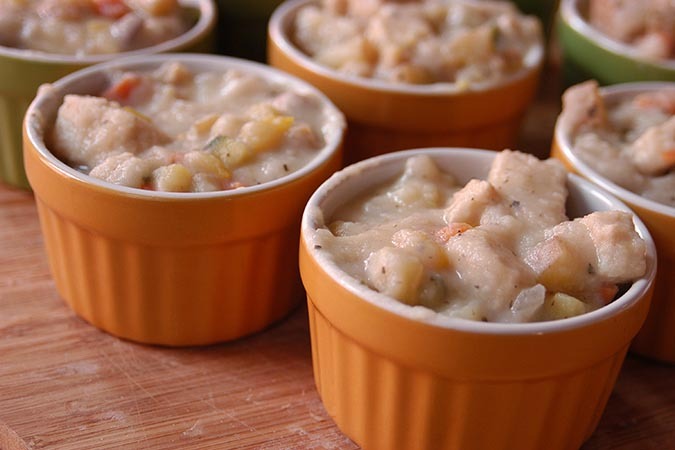 Spoon the stew into each ramekin. 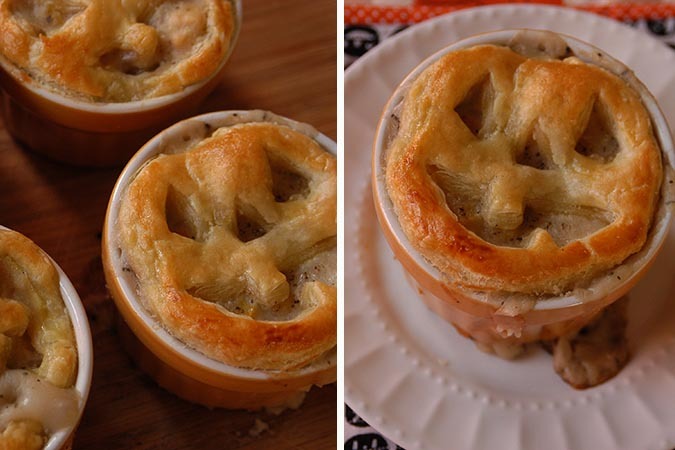 Uncover pastry and use your cup/or extra ramekin to cut out your circle faces. Then use a small sharp paring knife to cut out faces. Basic triangles work best and the dough is easier to cut if it’s not fully defrosted. Lay each face on top of a ramekin and press lightly around the edge to seal. If doing an egg wash beat 1 egg in a small bowl and brush beaten egg onto each face. Bake the cookie sheet of ramekins in preheated oven for about 20 mins until faces are lightly browned.